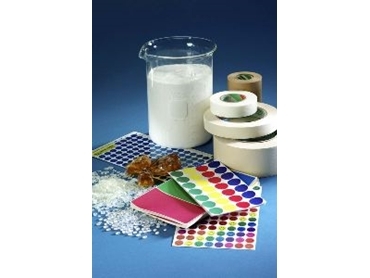 EASTMAN Chemical Company has introduced Tacolyn 3509, a low surface tension (LST) resin dispersion for use in waterborne adhesives for tapes and labels. Tacolyn 3509 eliminates the need for surfactants or other wetting agents in waterborne adhesives, reducing formulating costs and improving product adhesion to an array of materials, including polyethylene and polypropylene. Solvent-free and environmentally friendly, Tacolyn 3509 resin dispersionsimprove the tack and peel properties of waterborne pressure sensitive adhesives based on acrylic or SBR latexes. The low surface tension of Tacolyn 3509 allows formulators to achieve good wet-out properties without post-addition of foamy surfactants or other wetting agents. Reduced surfactant-levels in pressure sensitive labels also improves water resistance, enabling better adhesion under humid conditions such as long-term storage and shipping. In addition, low surface tension technology results in dispersions with higher solids at the same viscosity, allowing for faster drying of adhesive films.